Water Based LiquiSet is excellent and mixes easily. Can be used as a setting agent for MagiCakes, Lumiére, Color Cakes and Cake Eye Liner for a smudge proof and water resistant finish. 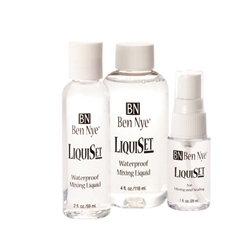 LiquiSet provides a smudge and water resistant finish, yet wont 'seal' makeup in the container. Available in 1oz and 4oz size.